Dear Freinds: Please read this and interject advice if you've done a job like this so I can avoid mistakes. My old Nording is on its last leg. Alas, it has a crack in the tobacco chamber from dead center all the way to the top. Tom Cristiano and family lived nearby when I had a smoke shop in Tampa, mostly online. I bought pipes from him, so I would stop in an and watch procedures just long enough to avoid being a nuisance and then try things in my own work shop. Sadly, Tom died a few years ago and I sorely miss him. He was a salty wheeler dealer and was a wealth of knowledge on two legs unlike a great many souls we have known. I wish I could ask him! I boiled all the wax, finish and fillers out of this freehand and any loose char. Now I have a beautiful piece of blond briar that had once been stained walnut and stamped A NORDING Made in Denmark, but no more. The stamping was done post SON era, likely circa 1960s. I’m certain that there are heat resistant fillers about but I don’t know of one that I would trust off the top of my head. My plan is to vibrate any dry dust out of whatever fissures there are and petrify the inside of the crack with a wood hardener. Then, if a pipe repair prophet has not appeared to me and said I will certainly burn in hell for destroying Mr. Nordings stamp and work, I’ll fill in the cracks with clear epoxy resin and use an alcohol based stain to bring out the beautiful flame and bird’s-eyes, likely a light cherry or flame orange. I’d like to finish it with a very light clear linseed oil over a few months and heat temper it. The goal is to re-harden the wood, artfully hide the nasty crack and wax it. 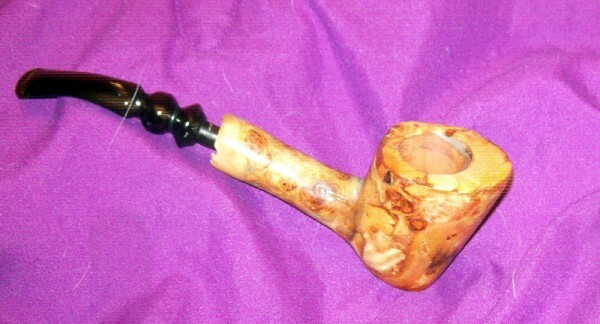 I have also entertained the idea of inserting and cementing a briar plug filler into the tobacco chamber and drilling it with a spoon bit 7/8” and re-boring the tenon. I wouldn't go to all that trouble for a Nording -- even one that has served loyally for many years. It deserves retirement. However, if you're interested in rescuing it from a hobby perspective, then the briar wood plug approach seems best to me. I don't know a thing about doing that, but I'm guessing that the plug's shape would have to accommodate heat expansion. BTW, did the crack develop from excessive carbon build-up, or heat, or a natural flaw? I'm interested in saving it because it was an "A" grade free hand and an early example shortly after SON. Mainly, its a history thing. Forensics tells me that the crack likely happened from poor maintenance. There were some deep pits in the side wall. I've seen that happen when folks use a pocket knife to ream a pipe and take a huge chunk of cake out, leaving a hole. Then there's a hot spot that develops into a pit over time. I sent an email to Mr. Nording this morning, as he answers email, sent pics and offered to send it to him. I have respect for those old guys who had an idea and went for it. Reminds me of my dad. I have pictures of this pipe. Haven't figured out yet how to upload them. Received a kind note from Mr. Nording suggesting I blow taps, say a prayer and bury it. However, I have always wanted to do a face lift and chamber plug so I'm going to give it a whirl. if there are such things, can give you some tips and clues. Good luck. I'm goin'for it. I have the tools and the time at present. Posted a pic in my album if anyone wants a look. I'll post progress as I go. If you plan on smoking it again when you're done refurbishing the odds are it won't last long. If you want it for historical reasons just take your time with the work and it would no doubt be well worthwile. Hoo-boy! Looks like it's terminal to me. Is that a crack in the shank too? I wrote an article with pictures about the repair. I'll post it once I get them all in there, There are no cracks in the shank but I accidentally sanded off part of the stamp. It may surprise some folks how long a repair like that can last, especially if care is taken to make sure that the plug is tapped in properly and the glue is properly applied with no bubbles or empty spaces in fissures. 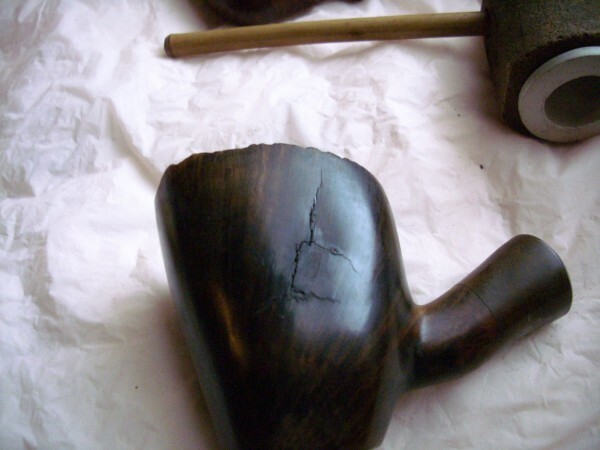 On the face of the pipe, I drilled out the charred spot and the traveling crack. I shaped another piece of kiln dried cherry and blended it in. I then covered part of the face with a burl veneer. I'm waiting on a new stem now. 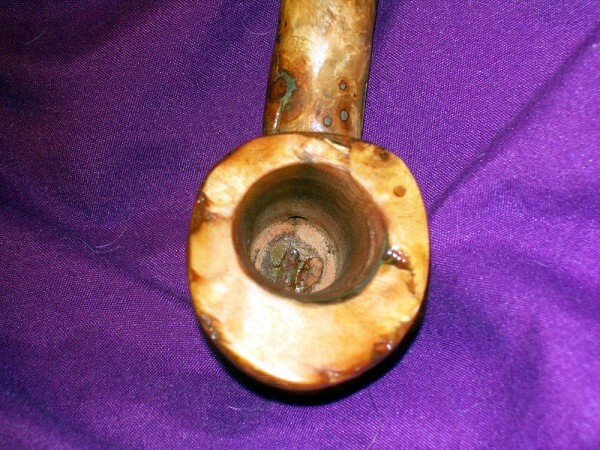 The pipe has a light oil finish now. After I stripped it clean, it was like new. When I first posted this, I wanted to see how many people had done this and if there was a need for an article. Of course, there are a hundred different ways to do it but my method has worked on other pipes. Perhaps someone may benedit from reading it when I finish. new briar in places and burl veneer. Check my album if the pics don't load. Cherry chamber next to briar. Looks less like something out of my old pickup and more like a new pipe. New briar in places and burl veneer, Cherry chamber tapered from 7/8" to 5/8" at the bottom. Side walls are about 1/4". Plateau shaved off. Original ferrule is under the veneer. Used JB Weld. Handles 600 degrees. No glue anywhere near tobacco. No thin briar anywhere. Pipe is the original full size freejand type, about 5" in length. Might go for another 50 years!